This cream is made using the moisturising base of our Full Cream with the addition 10% MSM (Organic Sulfur) and the removal of Milk Protein. This is the maximum amount of MSM we could add to the cream. Just mention MSM and watch the Naturopaths go nuts about its skin calming properties. The cream uses Sweet Almond Oil which is one of the best moisturising oils for irritated skin due to its essential fatty acid profile. The cream is also fully loaded with other natural skin healing ingredients. These include Allantoin (Comfrey Root Active), Vitamin E, Aloe Vera and Honey. Check our "We Got Mail" Page to see how it has worked for others. Aqua (H2O's Fancy Name), Dimethyl Sulfone (MSM Organic Sulphur), Cetearyl Alcohol (Plant Based Emulsifying Wax), Prunus Amygdalus Dulcis (Sweet Almond) Oil, Cocos Nucifera (Coconut) Oil, Olea Europaea (Olive) Fruit Oil, Aloe Barbadensis Leaf Juice (Aloe Vera), Squalane (Olive), Piroctone Olamine (Olamine Salt), Guar Hydroxypropyltrimonium Chloride (Guar Gum), Polysorbate 60 (Food Grade Emulsifier), Mel (Honey), Allantoin (Comfrey Root) Extract, Acetum (Apple Cider Vinegar), Pyrus Communis (Pear) Fruit Extract, Vanilla Plantifolia (Vanilla) Fruit Extract, Citric Acid (Natural Preservative), Tocopherol (Natural Vitamin E), Humulus Lupulus (Hops) Extract. Dimethyl Sulfone (MSM Organic Sulphur) MSM is an Organic Sulphur compound which is present in every cell of the body. MSM has been proven to be a great skin softener and soothing compound for irritated skin. Often used in many anti-ageing cosmetic applications. It is non-toxic and promotes healthy skin for all types. Mel (Honey) Honey is great for healing the skin and a natural anti-bacterial. We also love it for the balance it gives to the Apple Cider Vinegar which we also use. This makes for a beautiful smelling cream without fragrance. Allantoin (Comfrey Root) Extract Comfrey Root has long been associated with soft, healthy skin. Allantoin is a skin conditioner that has been purified from comfrey. A soothing and non-irritating ingredient, Allantoin is thought to help maintain healthy skin by encouraging the removal of dead skin cells and stimulate the growth of healthy skin tissue. Vanilla Plantifolia (Vanilla) Fruit Extract Vanilla extract is used primarily as a sweet fragrance. Vanilla has some antioxidant, anti-inflammatory and skin firming properties. We use hops to preserve our cream and Vanilla combines well with the hops and other fruit extracts to keep our creams smelling nice. Citric Acid (Natural Preservative) Citric Acid is a weak fruit acid used as a fruit based pH Balancer, and a natural preservative. 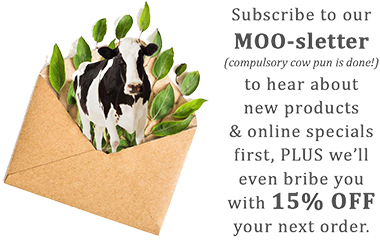 I've never before written to compliment a company's products, but boy does MooGoo deserve it! I'm 26 years old with extremely sensitive skin and have suffered with sporadic bouts of dermatitis for as long as I can remember. The outbreaks leave me with flaky, itchy, red skin so inflamed that I'm left in constant discomfort. I've been to dermatologists and tried a plethora of creams and cures, but they never work in the long term, and many times have made my skin worse. Besides, I hate the idea of just chucking chemicals on my skin to suppress an outbreak, without actually treating it. The last outbreak I had was the worst; my skin was so taut and uncomfortable I could barely laugh, raise my eyebrows or open my mouth to eat. It looked bad enough that colleagues asked what happened to my face (embarrassing!) and felt bad enough that even washing it with plain water was irritating. Products I'd had success with in the past weren't helping much, and I was at my wits' end until a nice lady who worked at the chemist suggested MooGoo, even though they didn't stock it! I Googled your product, liked what I saw and headed to the health food shop on a wing and a prayer because I couldn't wait to get my hands on it. I bought the Milk Wash, Ezcema & Psoriasis Balm and the MSM Soothing Cream. I wasn't expecting miracles but with an important presentation looming at work, I was nearing desperation. OK, I wasn't expecting too much of a difference, but it sure felt like I got one. The first time I washed my face and applied the balm, my face instantly felt more comfortable. No itching, much less taut. I put on the soothing cream and went to bed. Lo and behold, I woke up with visibly improved skin -- not as red, not as flaky, and definitely not as painful. Within three days, the MooGoo regime had completely cleared up the dermatitis! I have never had such success with a skin cream! Of course, I immediately became devout to my three little go to products, and my skin continued to improve exponentially. Two months down the track, my skin has never been better. I get compliments all the time! I've not had a dermatitis outbreak since I started using MooGoo, despite the steely cold Autumn weather that would in the past definitely have triggered an outbreak. MooGoo completely cleared up the bits of adult acne I had, and even improved the texture of my skin in terms of scarring and pore size. I've converted my whole family to MooGoo and sing its praises whenever my skin or skincare in general is brought up. It's sorted out my brother's persistent eczema and worked more effectively than my mum's expensive anti-aging creams. MooGoo, I cannot thank you enough! You've made an affordable, effective product with a great ethos that works wonders. You've got a lifelong customer in me! I just wanted to give you some feedback on your MSM Soothing Cream. I bought it to help soothe my skin during an outbreak of pityriasis rosea. I was told there was nothing I could apply to my skin to make the horrid red spots go away. So I decided to buy your MSM cream. Well I'm convinced - [edited due to regulations*] cream is right! After just 3 uses of your MSM cream the scaly dry red patches have almost completely gone! I was not expecting that! I love your conditioner too - awesome products. Thanks MooGoo!